zarinahtakesapaycut: Dato Seri Najib, can corruption be eliminated without dealing with fraud? Dato Seri Najib, can corruption be eliminated without dealing with fraud? PEKAN: Corruption and leakages are not only affecting the government's revenue but also the nation's economic performance, said Prime Minister Datuk Seri Najib Tun Razak. In beginning a discussion about corruption it is important to start with some theory about fraud. This is because fraud and corruption are linked. However they are not the same, rather they are like two concentric circles that overlap in some areas but are separate in others. Dato' Seri Najib is charting us towards becoming a nation where corruption will hopefully be but a memory. But can the PM accomplish this momentous task if we allow fraud practices to remain unchecked? PricewaterhouseCoopers Malaysia is the largest audit firm in the country. It would be reasonable to expect that they will not allow any questions regarding their business practices, especially if the questions cast the doubt that there is ongoing fraud being perpetrated by the firm's senior partners, to remain unanswered. But that is what they are doing. Despite the unceasing questions raised here and elsewhere, they choose to remain silent over the allegations of fraud. If the allegations of fraud remain unanswered because PwC Malaysia know that the allegations are true, ergo, there are no reasonable explanations they can give to remove the stain of fraud from affecting them, then we have to ask if the possibility that the largest audit firm in the country can also be tainted by corruption is there. Chin Kwai Fatt and the audit firm he runs have not answered the allegations of fraud against him, or made a report to the MCMC or the Police on this blog. So, if as a nation we allow the largest audit firm in the country, PricewaterhouseCoopers Malaysia, to escape from answering to allegations of fraud, what does that mean in the fight against corruption? Do we consider bribery as the only form of corruption worthy of being addressed? Among the factors that allow corruption to flourish are lack of transparency (how did PwC get registered by the AOB without the fraud becoming apparent?) and silence (not only the silence by PwC, but also by the various watchdogs like the MSWG etc). Bottom line is that the country will not be able to fully address corruption, if the corporations and other public interest entities know that they can get away with fraud, just like PwC Malaysia is doing. 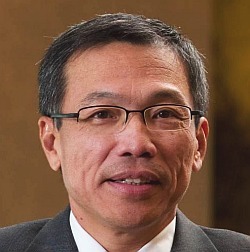 Who better to learn from, than the largest audit firm in the country, and its MD, Chin Kwai Fatt, on how to get away with fraud.